READ, WRITE, TALK, SING, PLAY! 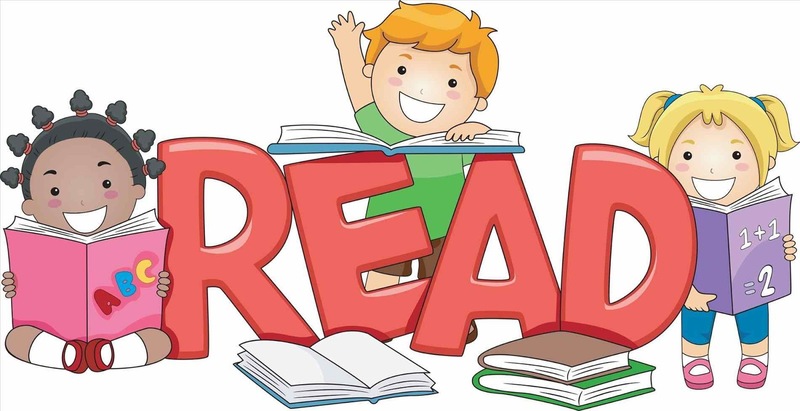 I recommend to read stories, do interactive felt boards, use puppets to tell stories-- once you tell the story go back through and sequence it with them. Ask questions about what comes first, second, third etc. I suggest to label things in your home or classroom with laminated print labels for (simple things) within the room like sink, chair, rocker, bathroom, wall, table so that the kids will get exposed to even more print. I also recommend for beginner readers or toddlers to go on a picture walk through their favorite books. If they love trains for example find a good book and share it together through just the pictures. 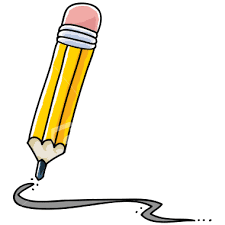 Ask basic questions about colors, sizes, shapes or even sounds throughout the story. When in the car or on a walk this is the perfect time to point out and look at letters and print to make them aware of what letters and shapes look like- M for Mcdonalds, bullseye for Target , a stop sign etc. Practice with them how to hold a pencil and a crayon in their hands. I suggest starting with some thing short like a golf pencil and showing them how to grip with two fingers. 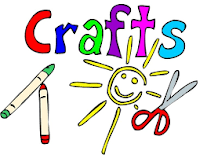 I suggest to Parents to work with their child to help them write their name on a craft or even to practice letters using different fun texture materials like in trays of rice, shaving cream, flour, salt, or even play sand. 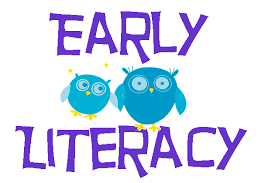 To let them see the print letters first use a coloring sheet with the letter or flashcards of each letter. Practice putting together the letters of their name or small simple words magnetic letters work great on the fridge or even and old cookie sheet where they can be moved around to form simple words like cat, bat, ball or even a simple name like mike or sam. They do carry dry erase boards and markers for this same idea at the dollar store that can easily be wiped clean too. During my storytimes I have also given out ABC themed coloring sheets, a particular Die cut letters for story time or as part of a craft or at the end of story time. I love to do lots of songs, rhymes and music in storytimes with kids. I usually like to incorporate actions songs like twinkle twinkle little star, ABC song, 5 little monkeys jumping on the bed, If you happy and you know it to have the kids help me sing them. 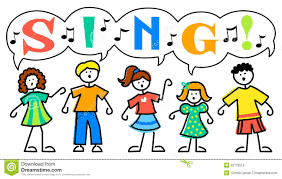 Make simple songs like itsy bitsy spider or even the ABC song action orientated with movements-- with ABC have them swim their arms or stomp their feet while they sing- its about keeping them focused and engaged and learning about rhythm. I have made a set of shakers for my kids using easter eggs with silly faces and filling them with rice or beans and taping them closed. We use those as part of our singing too. I also have rhythm sticks we use with songs and also a paper plate with bells attached too. I use some great participation music CD's artists like Laurie Berkner, Jim Gill, Dr Jean Feldman, Mr. Eric (Eric Litwin), The Wiggles and Greg and Steve, Raffi. These are all easy things to recreate at home in your reading space. Have a CD player or download their favorite songs on your phone through I-tunes and share them together. Make it your own mini storytime at home. 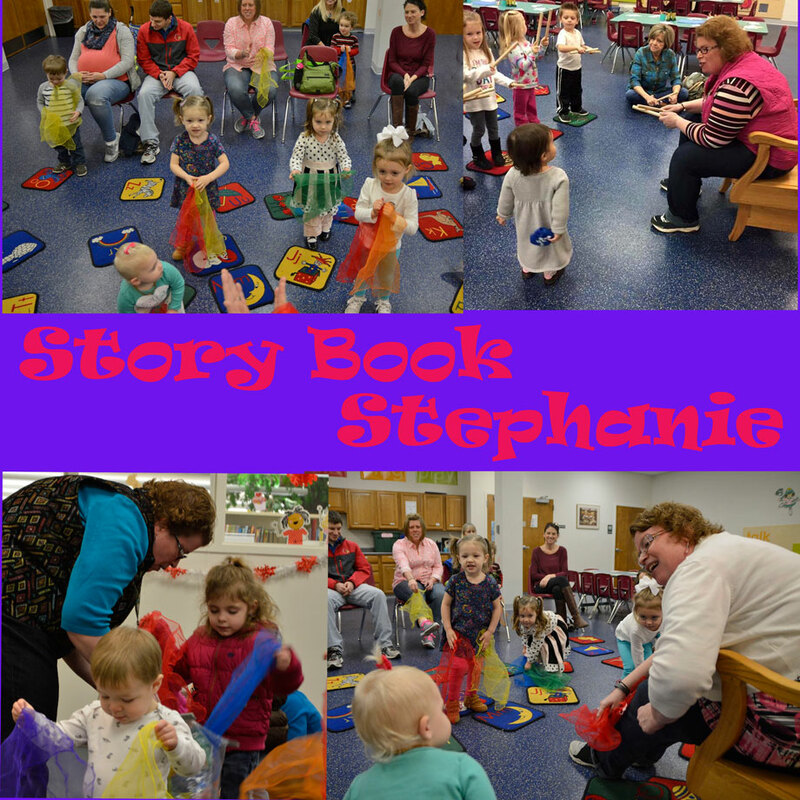 For some of my music parts to story time we also do dancing songs using colorful scarves, crepe paper, scraps of ribbon. I also have a parachute that I get out to use with my toddlers and preschoolers were we are learning together to hold the handles, lift the parachute up and down and shake the parachute together. I also use felt boards a couple times a week with the toddler and preschoolers. The kids can assist me with these by putting the pieces up, taking the pieces off etc. I think these are a helpful tool to keep them focused and participating in story time. For parents if you do not have the money or want to invest in a parachute then a flat sheet or large tablecloth will work just fine for parachute activities. 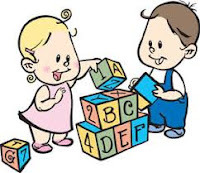 I also recommend that getting out some toys for them to play with like plastic bears in three sizes for counting, sorting and making patterns on matching cards or even some age appropriate building toys that are plastic that we also use that fit together. 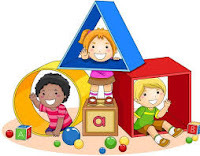 This will teaching them basic skills like sharing, working together and taking turns which are all wonderful skills to have when they are in a classroom with other kids. I also have sent the kids on a scavenger hunt to find things related to our storytime theme in the room usually taped to the walls and then we bring them back, talk about them and may even count them and sing a little song about them to the tune of ten little indians. I usually ask questions during story time especially in the beginning to have the kids figure out our theme for story time. What shape is this? what color? I ask questions while reading stories too. What do you think is going to happen next? What do you see on this page? How Does the character feel by facial expression? How many animals or people do you see on this pages? What are they doing? Try to use many tools that the kids will be exposed to in school- crayons, markers, glue, child size scissors. There are many resources like cutting practice or tracing practice worksheets online that you can print off and use with your child to increase their motor skills. Create word related collage art using magazines, cereal boxes and newspapers for different types of letters and create words using these cut letters. Make and Alphabet book with pictures and words from grocery adds or store adds together.